When I was a kid I was all about St. Patrick’s Day. Something about leprechauns and pots of gold just totally captivated me! You can bet that I was precisely the kind of kid who always wore green head to toe to avoid being pinched, too. My kids follow closely in my footsteps, and of course, they love the idea of finding a pot of gold at the end of a rainbow. 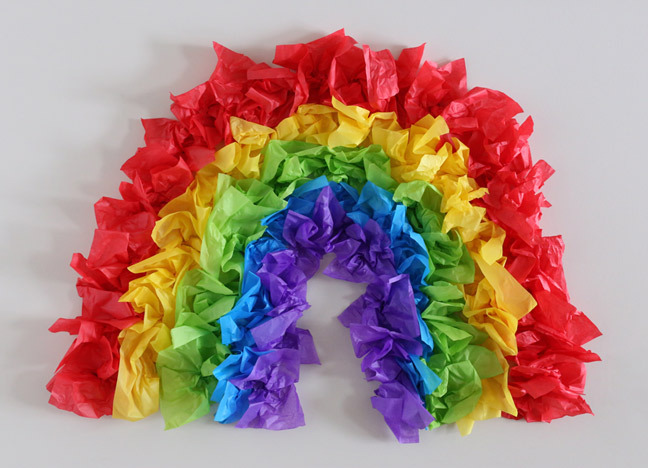 This awesome (and awesomely easy) giant DIY tissue paper rainbow makes a fun backdrop for photos, and makes a plain wall temporarily colorful to get in the spirit for St. Patrick’s Day. All you need to pull this off is a few basic craft supplies, a couple of little hands to help you out, and about a half hour of your time. Then you’re officially ready to welcome any number of shenanigans that may come your way this St. Patrick’s Day! 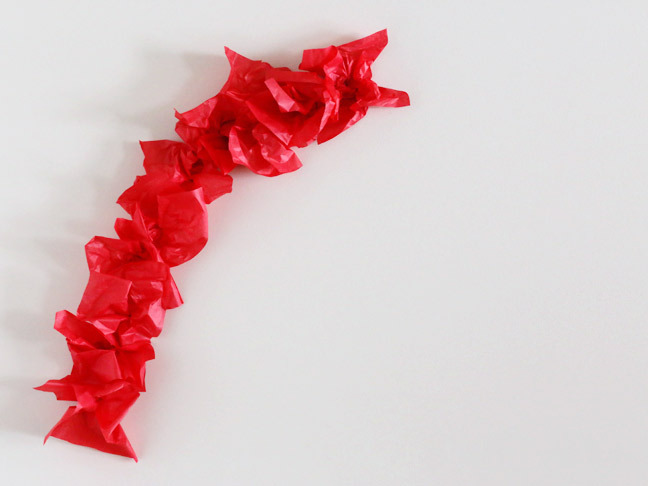 Step 1: Begin by cutting your sheets of tissue paper into smaller rectangles. I simply folded my paper in half and in half again, cutting along the folds to create smaller sheets. There’s no need for precision here! Just eyeball it and cut away. 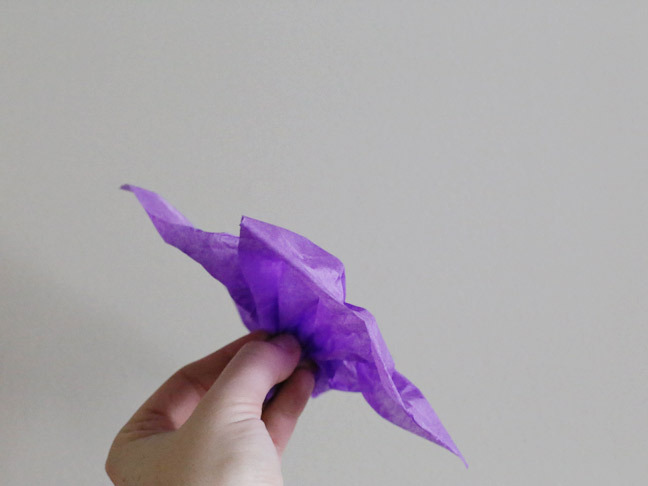 Step 2: Beginning with either your purple arch or your red arch, grab a sheet of tissue paper and pinch it in the middle to create a bit of a pouf shape. 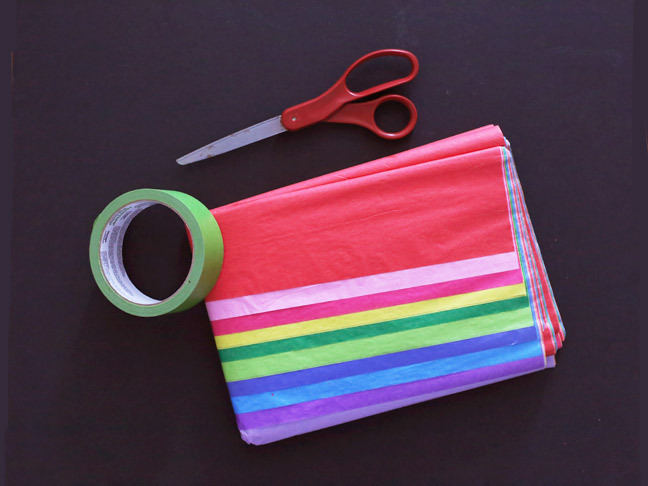 Pick a spot on your wall where you’d like the middle of your rainbow to be, and attach your paper pouf to the wall with a rolled up piece of painter’s tape. Step 4: Continue with each of the subsequent colors until you’ve formed your rainbow! 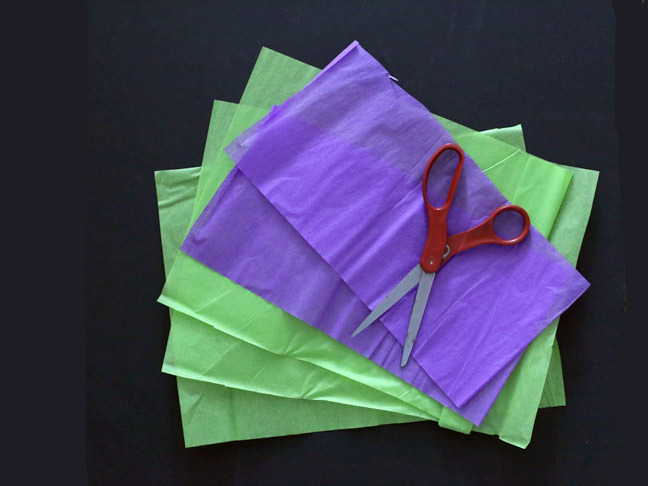 This is such a simple craft that the kids will love helping you cut, pouf, and tape. The painter’s tape makes it easy to remove without messing up your paint, and this cheerful little rainbow makes the perfect St. Patrick’s Day party backdrop!